FAYETTEVILLE, Ark. – Arkansas-produced rice would be popular in Cuba and the nation wants to buy it if the U.S. trade embargo is lifted, a Cuban diplomat said Wednesday during a visit with University of Arkansas System Division of Agriculture officials. Under provisions of the embargo enacted by Congress in 1962, Cuba must pay cash to import American products. Lamigueiro said commercial credits are necessary to support high levels of international trade. “We really need the support of Arkansas companies to put away all these restrictions and to start with no more trade conditions, an important change for important commerce between Arkansas and Cuba,” Lamigueiro said. 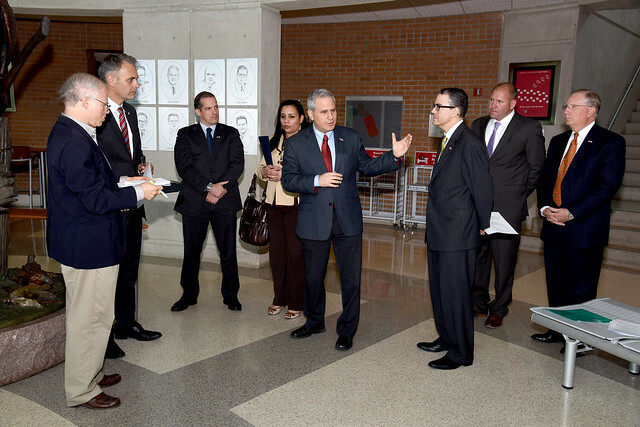 Lamigueiro was one of three officials from the Cuban Embassy who came to the Fayetteville campus during a three-day visit to the state. He was accompanied by Yusel Arias Cruz of the Ministry of Foreign Affairs and Karin Diez, a first secretary in the embassy. They were escorted to campus and other northwest Arkansas locations by Dan Hendrix, president of the Arkansas World Trade Center, and other officials from the center. Jean-Francois Meullenet, head of the Food Science Department at the Division of Agriculture and for the Bumpers College of Agricultural, Food and Life Sciences, introduced members of the delegation during a news conference at the Center of Excellence for Poultry Science on campus. He and several faculty researchers met with the Cubans to describe the division’s agricultural research activities. “We’ve had the pleasure of visiting with them this morning to talk about the work we’re doing in local foods, food innovation and food safety, as well as poultry production and poultry disease prevention,” Meullenet said. Lamigueiro said the group discussed future cooperation between U.S. and Cuban universities. He praised Arkansas agricultural production and said university research would be an important factor in exchanges between Arkansas and Cuba. “We see the relationship between Arkansas and Cuba where companies, universities and institutional research would play a role,” Lamigueiro said. He added that the Arkansas World Trade Center has helped the Cuban government identify companies that would be interested in investing in Cuba and doing business there. Lamigueiro said his government is working with the center to organize a delegation of Arkansans to visit Cuba. Noting that the number of American travelers to Cuba has been predicted to increase, Lamigueiro said Arkansas agriculture could benefit. “If we reach 1 million American visitors to Cuba, we will need to import agricultural products from Arkansas,” he said. Earlier this week, Lamigueiro participated in a news conference in Little Rock at which a state council of the national organization Engage Cuba was launched amid calls for an end to the U.S. trade embargo. Arkansas Agriculture Secretary Wes Ward and Dow Brantley of the USA Rice Federation also participated. The Cuban delegation was also scheduled to visit with representatives of several northwest Arkansas industries during its visit before leaving Thursday. For more information about the agricultural research being done within the Division of Agriculture, visit http://aaes.uark.edu.